Toyota drivers are loving the all new Corolla trims. Affordable, reliable, and safe, Corollas have become one of the top compact cars on the market today. The Corolla has changed a lot in the past five years, but the latest redesign brings more performance and sporty looks to the old compact design. The Corolla also has several different options to choose from, but many new drivers are going for the Hatchback XSE and XSE CVT. With the most fuel efficiency on the market in compact cars, you’ll get up to 38 miles per gallon on the highway in the XSE CVT, which is the most modern trim for the lineup. Starting at under $25,000 for even the highest premium trim in the Corolla models, you’ll get tons of value out of this vehicle for many years. 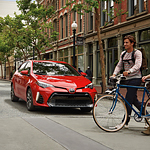 Want to test drive the new Corolla? Stop by Victory Toyota located in Seaside for more information.